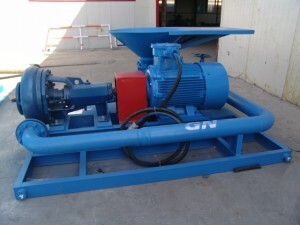 Mud mixing equipment ususlly includes mud hopper, mud gun, mud agitator, jet mud mixer. Offshore mud mixing equipments needs marine explorsion proof motors for mud agitator and centrifugal pump. Tanks of offshore drilling is usually different, so mud mixing unit is very special, the shaft of mud agitator must adopt the depth of the tank, so does the length of the mud gun. Usually our agitator have two impellers, as the tank is very deep, we design three for them now. 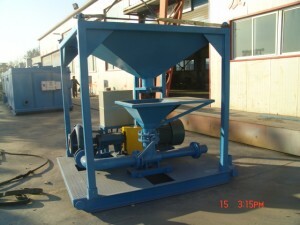 We make shearing jet system for bentonite polymers and other powder additives mixing.We links the shearing jet system to the mud mixing tank for assisting in achieving the properties needed from drilling mud such as viscosity for hole cleaning, water loss control and filter cake build up. In the GN Jet shearing system, mud passing through the hopper venturi is directed to pass through specially designed jet orifices to impart additional shear energy. 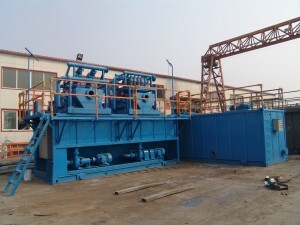 Mud jet mixing system is available for oil gas drilling & HDD (Horizontal directional drilling). 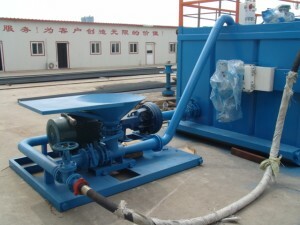 Jet mixing pump is ok and what i understand from the photographs is that this jet mixing system is for online usage. That means that the mud is to be mixed while the intake of water is going on which is contrary to the actual system adopted in directional drilling wherein the water tanks are filled up first and then the mixing procedure starts so what we actually need is a jet mixing system which can actually act as a stirrer in the mud tank itself. We must also keep in mind that the speed of water intake is much higher than pouring of bentonite so online system for simultaneous water intake and mixing seems a little typical. I will try and send you some snaps of typical mud mixing system used in HDD in my next mail which can throw some more light on what i am trying to convey. 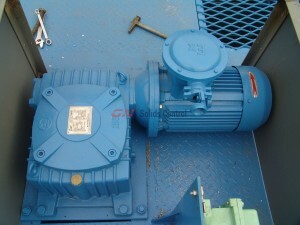 Mud agitator Sand pumps for mud tank manufacturer. As a drilling mud agitator and sand pumps manufacturer, we inquiries from our international mud tanks manufacturer client asking for buying mud agitators and sand pumps from us. Because outsourcing mud agitators, and sand pumps will save their cost, and production price. I am interested in the prices for the mud mixing pumps ( with explosion proof motors ) , 11 Kw and 15Kw agitators,sand pumps etc , as we are producers of mud tanks for the oil industry here in Libya. As a mud tanks manufacturer, Our Company is working with all major oil Contractors in Libya , and are depending on orders from them. At the moment we have orders for 2 x 3,000 bbls drilling mud systems only – we will be looking for the equipment for them, but last time the conditions which we received from your Company ( also prices ) were not very different from the prices which we have for similar equipment from the United States. And you must understand , that in such case we are going to purchase from there – as reputable manufacturer. To buy from your Company you must be much more aggressive in pricing and delivery conditions – please re-consider. I appreciated your call – you must understand , that our purchase will depend not only on the price , but also on after sale services and spare parts availability , as we want to offer to our customers reliable products. Consumables for above pumps – seals or mud guards. We are looking forward to cooperating mud tanks manufacturers, we manufacturer equipments like mud agitators, sand pumps, shale shakers or centrifuge them.Work on win-win situation. When design HDD drilling mud mixing tank,and storage tanks,when should take the following items for consideration. Welcome to Consult us for HDD drilling mud tanks or mud system design as well as oilfield drilling solids control system design.Cost-effective solutions are guaranteed . All Mud Tanks to be equipped with agitators with sufficient turnover rate to prevent settling mud. All drilling mud tanks shall be equipped with level sensors. 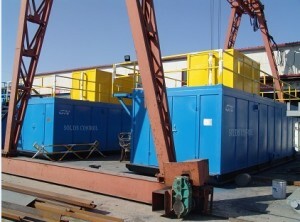 Electrical equipment shall be suitable to be located in zone oilfield environment. The chemical dosing system shall consist of 5 feeding stations where 4 stations are combined for dry bulk and liquid. The feeding stations shall be able to feed into two separate mixing lines. The unit shall be able to handle single sacks. The chemicals shall be transported, stored and mixed without any risk for spillage orharmful exposure for personnel. The drilling mud tanks shall be completely covered and ventilated with inspection hatches. The HDD (Horizontal directional drilling ) mud tank design shall ensure easy cleaning and easy access. The H.P. shear unit shall be located in the mud mixing tank, chemical mixing tank, and one storage tank.Two separate mixing lines shall be available simultaneously to familitate mixing in both the active and storage system. The triptank shall be designed to measure volume variance down to 0.1m3. Measurement by two independent systems. GN Solids Control design manufacture and export drilling mud mixing tanks and drilling mud storage tanks internationally.Welcome to contact us to consult for design and manufacture drilling mud tanks. We also design HDD drilling mud tanks mounted with Equipments like desander,desitlers,or mud cleaners. Each drilling mud tank shall have possibility to be isolated from the system during maintenance. he agitator gearboxes to be greased. One drilling mud storage tank and the slug tank to be designed for 2.0 s.g. mud. The reminding tanks shall be designed for 1.8 s.g. mud. 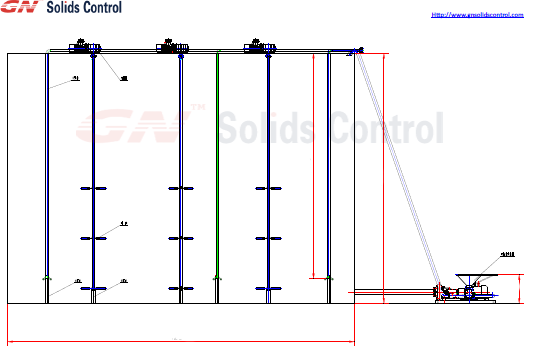 GN Solids Control design and manufacture complete mud tank system for customer internationally. To get material of -500 mm + 0,015 mm when solid rate of the pulp is under 30%,our ZQJ 250×100 Mud Cleaner(conbination of linear motion shale shaker+desander+desilter) will work well for your application. Because, the viscosity of drilling fluids is high since it contains clay,and bentonite. When mud viscosity is low,the separation effect will be better. To separate different rangle of particles,if particle size rangle you need is not very big as we thought when study the info. you sent us,we can design a complete mud tank system use different mud separation equipments like shakers,desilters,desanders,centrifuges.And also we can adjust the separation particle size rangle by using different mesh screens,different speed centrifuges.The specs in our brochure is for normal models. We enclosed the complete mud tank system from big to small for your info. 1,Different rangles of particle size you need to get? 2,The treating capacity of the mud you require,eg. 200 m3/h ? 3,The solid rate of your mud? Then will design a complete mud tank system for your application. Below; first of all, we want to give the answers of your 3 questions. 2-The treating capacity of the mud we require is; between 200m3/h – 250m3/h. 3-The solid rate of our mud would be maximum 30%. Currently, we continue flotation test works in order to fix the absolute particle size and the absolute pumps and machines capacities. We would like to state that we are quite pleased to cooperate with GN Solids Control and looking forward to have your engineer in November in Turkey. After we get the result,we’ll keep gn solids control blog updated about this deal,and provide the solutions about what complete mud tank systems we privided. GN Solids Control manufacture equipments including:Oil drilling jet mud mixer. China price.World service.Developed countries quality gas oil dirlling jet mud mixer. SLH series Mud jet mixer is a new special equipment in oil drilling field. This drilling fluid Mud jet mixer is a high performance equipment worked together with the solids control system for petroleum drilling.This Mud jet mixer is mainly used to configurate and increase the drilling fluid, change the fluid’s density, viscosity, and dehydration. The effect of SLH series oil drilling Mud jet mixer is more prominent if it matches with Shear Pumps. It is safe and stable enough to be moved conveniently. At the same time，GN company has several accomplished engineers, we can make Twin-Jet Mud Mixer according to the users’ requirements. 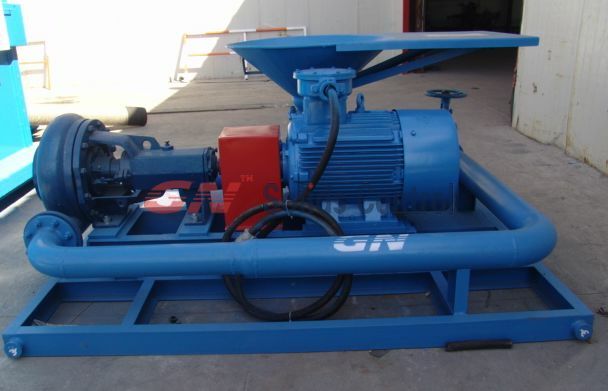 Best mud jet mixer for oil gas drilling.Buy equipments from GN solids control. 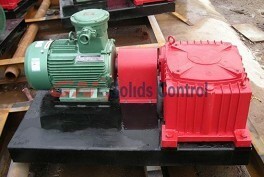 GN mud Agitators are manufactured in China facotry.But we offer worldwide sales and solids control oilfield service. Buy mud Agitators from China manufacturer,Enjoy good quality,fast service,and best price. GN company as a professional manufacturer for soilds control equipments, we have designed lots of high-quality products, and JBQ series Agitator is one of them. To keep both the mud uniformity and the suspension of solids, the mud agitator is used to agitate the mud consecutively and reliably.This agitator agitates the mud to make cuttings, silt and sand pass the solids control system without being precipitated onto the tank bottom. Due to the simplex turbine decelerator, this product is featured by compact construction, light weight, balanced transmission, low noise, high efficiency of transmission and strong agitating power. Therefore, it is a reliable product in the solids control system.